128 pages | 4 B/W Illus. High ability individuals – gifted students, prodigies, geniuses and twice exceptional students – are a group with enormous potential to have an impact on the advancement of different occupational fields, as well as the lives of others in society. 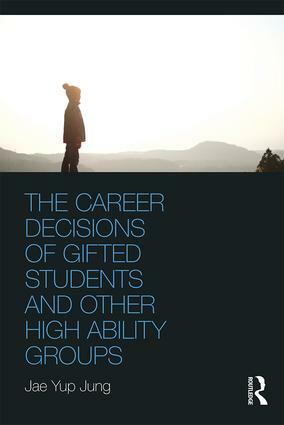 The Career Decisions of Gifted Students and Other High Ability Groups is the first ever scholarly monograph devoted to an examination of the career decisions of this group. Drawing on extensive research, it provides fresh insights into the history, the influential factors, and the processes associated with the career decisions of gifted students, prodigies, geniuses, and twice exceptional students. Of relevance to researchers, psychologists, counselors, teachers, policymakers, and families, it also provides possible directions for future practice, to allow for the optimal support of the career decisions of these highly able individuals. This book makes an important contribution to the international literature on giftedness and its relationship to career decision-making. The author compares career decision processes used by gifted students, prodigies and geniuses, and twice exceptional students. The book is a ‘must read’ for educators concerned with gifted education programs in schools, school counsellors and psychologists, and researchers in the field. Jae Yup Jung, PhD, is a senior lecturer and a GERRIC senior research fellow at the School of Education at The University of New South Wales.